Dr. Michael Scriven is a Distinguished Professor at the School of Behavioral and Organizational Sciences at Claremont Graduate University. Michael Scriven took honors degrees in mathematics and then in the philosophy of mathematical logic at the University of Melbourne, and his doctorate in philosophy at Oxford. Most people agree there is value in evaluating projects and lessons learned. My approach is simple - to be helpful. The mission possible is to promote good practices in project evaluation and lessons learned through established project management standards, methodologies and processes (i.e, PMBOK® Guide, PRINCE2, Agile, DMAIC). The vision is that organizations will become more effective and efficient. Book Signing at PMI Global Conference in Vancouver on October 22nd, 2012 where I received the 2012 Cleland Award for Best Publication. "The Basics of Project Evaluation and Lessons Learned"
Other book signings, presentations and discussions at companies and organizations. Note: The Cleland award recognizes and honors the best project management literature published during the previous calendar year. 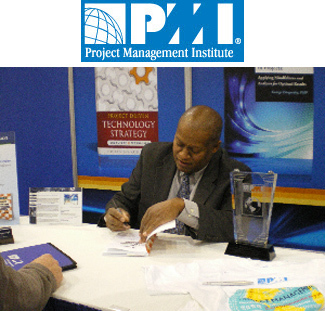 It recognizes the author for significant contributions and for advancing the project management knowledge, practices, procedures, concepts, or other advanced techniques that demonstrate the value of using project management. This page lists some of the new book launch-related acknowledgement/recognition. In March of 2012, I delivered a presentation featuring the book to the Project Management Institute Western Michigan Chapter. In March of 2012, I delivered a presentation at Western Michigan University (as an Alumni) and discussed the book. I served as conference chairman for the 2012 Global conference on computer and software validation for the Institute of Validation Technology. I had a presentation on Economic Evaluation (calculating ROI for computer and software validation projects), I also discussed my book and developed a competency model for computer and software validation professionals. APICS Recognized the book in the September/October APICS Magazine. I delivered a global presentation for ASTD on December 19, 2012 entitled Training Project Management - Tools and Techniques A Lessons Learned Approach. Here I discussed the book and its application to learning and development. ASTD also recognized the book in a write-up in the November T&D magazine. I was one of the featured speakers for International Project Management Day. There were 35,000 people that attended this global event.